How quickly time passes as we go about our daily routines. It has been five years already since Pope Benedict declared Mother Angeline Venerable. The date was June 28, 2012, and I remember receiving the news as we were about to begin a meeting of the New York Catholic Providers group held at the Terence Cardinal Cooke nursing facility in Manhattan. There is more than a little irony in the fact that we were not far from where Mother Angeline began the Congregation and were in a facility named for a Cardinal from New York City who himself is a candidate for sainthood. That day was the culmination of a long and involved process beginning with the creation of the Mother Angeline Society (originally the Teresian Society) in 1987, the petitioning of Bishop Hubbard in 1989 to begin a Cause for Mother for sainthood, and finally the actual opening of the Cause on the Diocesan level on August 15, 1992 – twenty-five years ago. Very Reverend Mario Esposito O.Carm. became the Postulator of the Cause after the death of Rev. Jude Mead, C.P. who laid the groundwork for all that needed to be done. Bishop Hubbard then appointed a Diocesan Tribunal to hear the testimonies of many who knew Mother. 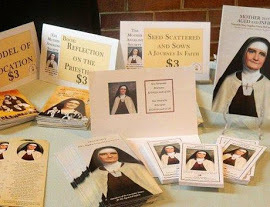 These testimonies, her writings and other pertinent material were then assembled by Sr. M. Teresa Stephen, O.Carm. and her dedicated group of volunteers. They followed the strict procedure of the Congregation for the Causes of Saints and sent over 12,000 pages to Rome in a crate so large a Sister could sit inside! We are delighted to celebrate the 25th anniversary of the Opening of the Cause on the Diocesan Level and look back in awe on all that has been accomplished. We continue to make Mother’s story better known through print and social media and teach her mission and philosophy to all involved in our ministry with the elderly. Now if we could just have a miracle attributed to Mother, our process would move to the next step. We pray this will happen soon. Previous Post: From the Pen of Br. Bob Chiulli, O.Carm.